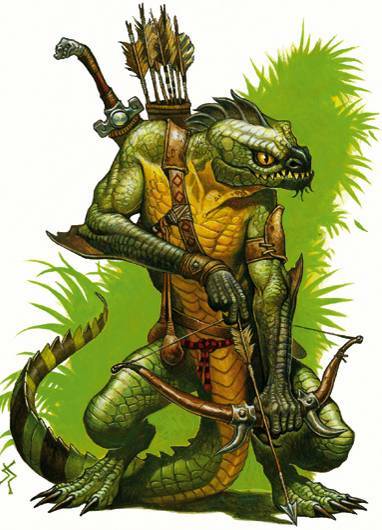 The ancient Lisshe, more commonly known as Lizard-Men are the remnants of the once great race who built powerful kingdoms in the distant past. Many have been reduced to tribes, who know only conflict and survival, led by Shamans but there are small bands left in disparate places on the planet who maintain a measure of civilization. These more civilized tribes are fiercely independent although they do interact with other races that are willing to trade in peace. Some of these tribes have even carved out formidable small kingdoms in terrains hostile to most other races. Lisshe have a broad variety of appearances from a general greenish scaled skin to stripes to intermingled fading colors. These differences tend to be specific to a region or tribe with minor variations to be seen in larger kin groups. Lisshe range in height from 6’4” to 7”4” in males and 5’ 6” to 6’2” in females, and live an average of 85-100 years. Curiously Lisshe do not age as other races. Once they reach maturity at approximately twelve years they remain vital until only a few months prior to their passing when they will retreat to a small space and enter a coma like state until they expire. This is known as the Final Shedding, a reference to the biannual shedding of outer skin that occurs. The outer hide of a Lisshe is very tough providing a natural armor class of 7. 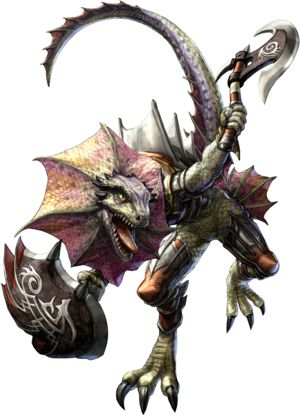 Lisshe are not cold-blooded but their body temperature is much lower than a Human’s; as such they do poorly in extreme cold weather and when in an area below freezing they move at half-speed and operate with half their Strength and Constitution scores. Likewise they are highly resistant to the effects of heat and gain a +2 to all saves against fire damage. Lisshe also get a +1 to Strength and Dexterity scores while suffering a -1 to both Intelligence and Constitution. Like Kenku, Lisshe are equipped with two excellent natural weapons: clawed hands (1-4/1-3) and tail (1-6). Their tail needs a full ten feet of open space to be wielded against an opponent and is considered a blunt weapon for purposes of damage and defense. Neither the tail nor their hands can be used to parry.